Ottawa – Mayor Jim Watson was joined today by Mona Fortier, Member of Parliament for Ottawa-Vanier, on behalf of the Honourable Amarjeet Sohi, Minister of Infrastructure and Communities, and the Honourable Bob Chiarelli, Minister of Infrastructure and MPP for Ottawa West—Nepean, to secure the final piece of track on the O-Train Confederation Line. Participating dignitaries began the event by paying tribute to Canada’s history. Standing in front of the iconic 1885 image showing the driving of the last spike for the Canadian Pacific Railway, the Mayor honoured the past while looking forward to the city’s transit future. Attendees then boarded the train at Tremblay Station and travelled along the track and into the downtown tunnel of one of the most advanced Light Rail Transit (LRT) systems in North America. Once inside the tunnel, officials hammered rail clips to secure the final piece of rail into position. The installation took place a few hundred metres west of the uOttawa Station. Beginning in June 2013, the Transitway from Tunney’s Pasture to Blair was closed to bus traffic in segments in order to convert the roadway to LRT track. Installing the last piece of track on the 12.5 km Confederation Line marks a major milestone for the project. The completion of track construction, as well as ongoing testing and commissioning activities, means OC Transpo’s Electric Rail Operators and many other key staff members will get first-hand experience operating the entire system from one end to the other in the near future. 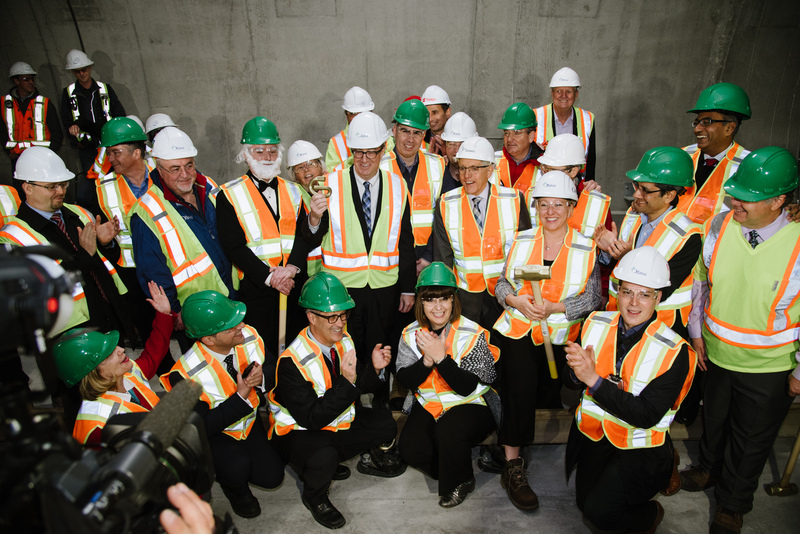 Work continues on the 13 LRT stations between Tunney’s Pasture in the west and Blair in the east, as the Rideau Transit Group works toward handing the system over to the City later this year. For more information on the O-Train Confederation Line, please visit OC Transpo’s Ready for Rail web section at octranspo.com/ready4rail. “Today we are here to celebrate a very important milestone for the O-Train Confederation Line Light Rail Transit project. When the O-Train Confederation Line opens it will help manage congestion, curb emissions and improve travel for people across this region. Ottawa’s LRT initiatives represent the single largest investment any provincial government has made to support Ottawa public transit. The cost of the project is $2.13 billion, jointly funded by the Government of Canada, the Province of Ontario and the City of Ottawa. The Confederation Line is 12.5 km in length. It contains 13 stations from Tunney’s Pasture Station in the west to Blair Station in the east. It contains four underground stations including Lyon, Parliament and Rideau in the downtown core, and St-Laurent in the east. Total length of the track, including the Belfast Maintenance and Storage Facility (MSF) Connector track and yard, is 33 km. 169,940 rail clips were used across the entire alignment.